York Region covers 1,776 square kilometres and stretches from Lake Simcoe in the north to Steeles Avenue in the south. It borders Simcoe County and Peel Region in the west and Durham Region in the east. The total population increased by approximately 20,600 in 2009 to an estimated 1,032,600 people. Forty-three percent of the population is comprised of immigrants to Canada (the average in Ontario is 28%). Thirty-seven percent of the population of York Region is a visible minority. Of that 37%, the groups with the largest populations are Chinese peoples comprising 42%, South Asians (East Indian, Pakistani, Sri Lankan, etc.) 24%, West Asians (Iranian, Afghan, etc.) 6%, Black 6%, and Filipinos 5%. People of Chinese descent were the most common ethnic group in Markham and Richmond Hill. 1 Chinese 21% 1 Chinese 138,575 1 Chinese, n.o.s. 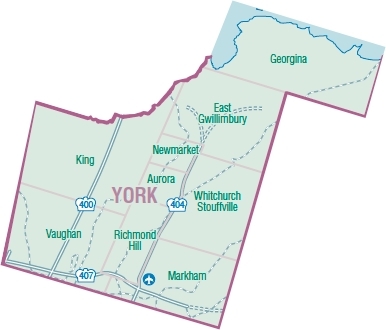 There are nine Area Municipalities in York Region. Each has its own website which can be accessed by clicking on the map or on the name of the individual municipalities. Established in 1976, AWIC has a long history of serving newcomers, primarily the South Asian Community in and around North York, Ontario, Canada. Over the past 34 years, AWIC has served over 35,000 clients by providing settlement and employment services. AWIC Community and Social Services provides settlement and employment services as well as training & volunteer opportunities for newcomers to Canada — giving them the tools to integrate and participate in Canadian society while maintaining their ethnic heritage.